Stock status is current as of 4/24/2019 7:53 AMET. 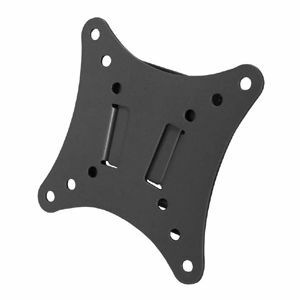 Low-profile fixed mounting bracket design fits LCD flat-panel TV/monitors from 10" to 24" and up to 33 lbs. (15 kgs). Mounts TV just 0.6 inches from the wall for a clean/low-profile installation. 2mm thick heavy-gauge steel construction with powder coated black finish for durability. Compatible with VESA mounting 50x50mm, 75x75mm and 100x100mm patterns.